Australian pop star and heartthrob Cody Simpson. Not too long ago, Australian-born singer Cody Simpson stood at a crossroad and was forced to choose between two dreams. And that one bold choice changed his destiny. PLUS: What would it be like to take Cody Simpson to the prom? 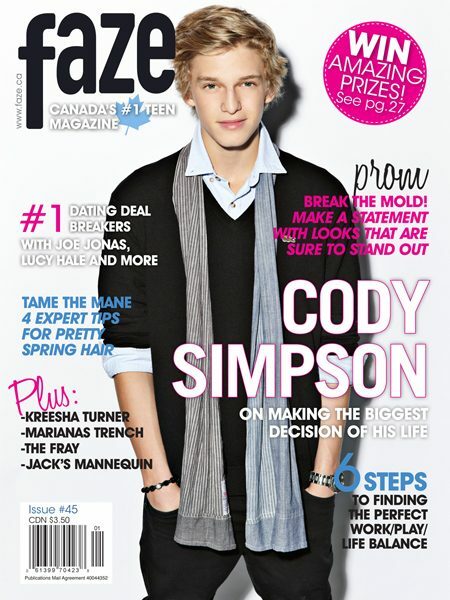 Go behind the scenes at the Faze Cody Simpson cover shoot! Get Real…Advice On Relationships: Celebs weigh-in on dating deal breakers. In terms of success, who do you look up to the most? FOR FUN: If you could be any superhero for a day, who would you pick? QUIZ: What’s your prom personality? Take our PROM quiz! Celebrity Takeover: BIG TIME RUSH took some time to rant with Faze.